The concept of cloud computing is not as new as we think – in fact, it has been undergoing a gradual evolution since the early 50s, when mainframe computing was first introduced to process huge quantities of data through a centralized platform. However, it wasn’t until the 21st century when decline in storage and processing costs, as well as faster connectivity speed, made cloud computing a disruptive force in the way we process information. But what is the future of the cloud? Today, we will look at 8 cloud adoption statistics that will show you the incredible potential of this technology for businesses and their customers. As a cloud solution provider of advanced services such as call recording, virtual fax and electronic invoice, we have observed an incredibly rapid growth in the adoption of cloud-based solutions during the last decade. 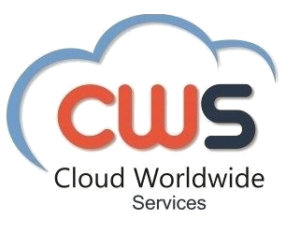 With more than 20 years of experience, Cloud Worldwide Services is a firsthand witness of how technologies are evolving to satisfy the needs of business and consumers for a faster and more convenient processing of data. 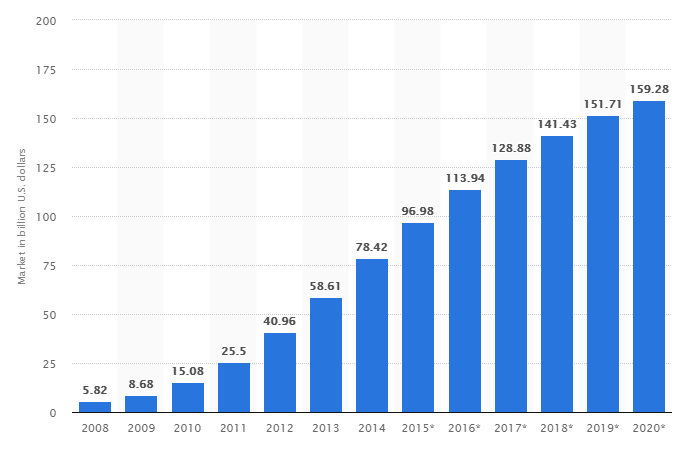 According to Statista, the public cloud computing market has been experiencing a continuous growth during the last decade – from only $58 billion in 2013, it is expected to double and exceed its size by the end of 2018, reaching 130 billion dollars. But that’s not all; by 2020, the projected increase in cloud adoption will reach almost 160 billion dollars. With the advances in data processing and the exponential decline in storage costs, more and more companies have been seeking the advantages of cloud computing technology. According to Cloud247, the majority of organizations will migrate their IT infrastructure to the cloud in the next 18 months, and only 40% of them will remain residing in on-premise systems. With the increasing percentage of global enterprises relying on at least one public cloud platform, it is estimated that annual global spending will increase by 19.4% next year. Considering that Cloud-First is becoming a global priority for many organizations, we are yet to see a bigger increase in annual spending in the upcoming years. Despite the increasing growth in public and private cloud adoption, hybrid infrastructures remain the most popular across all industries. 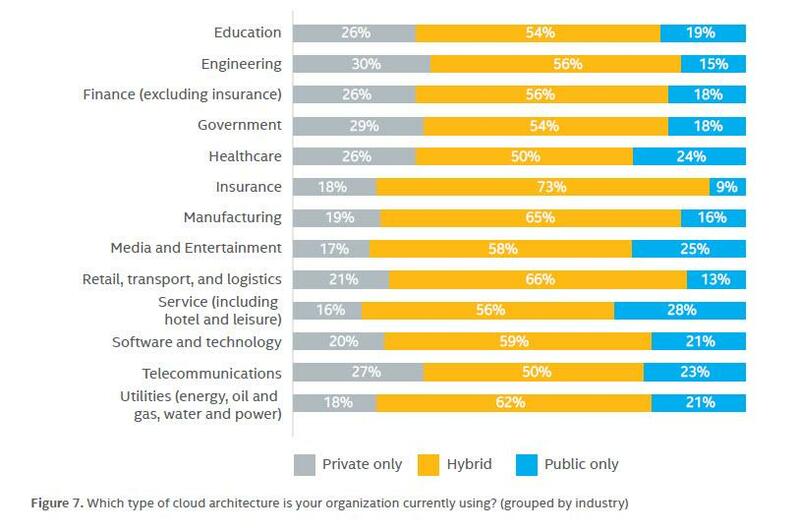 Hybrid architectures are especially preferred in the insurance sector, where only 18% of them rely on a private-only cloud, and 9% would rather stay with a public-only infrastructure. On the other hand, public cloud adoption is the highest among organizations in the services industry, with 28% of them relying on public-only technologies. According to the annual survey State of the Cloud, conducted by RightScale among 997 IT professionals, Amazon Web Services remain the leader among cloud infrastructure providers. However, companies like Azure, Google Cloud and IBM Cloud are quickly catching up – according to the survey, 45% of the respondents are already running their apps on Azure, 18% on Google Cloud, and 10% on IBM Cloud, while many others are still on the phase of experimenting. According to the above-mentioned State of the Cloud survey, public cloud is becoming a top priority for many enterprises this year, up from 29% in 2017 to 38% this year. 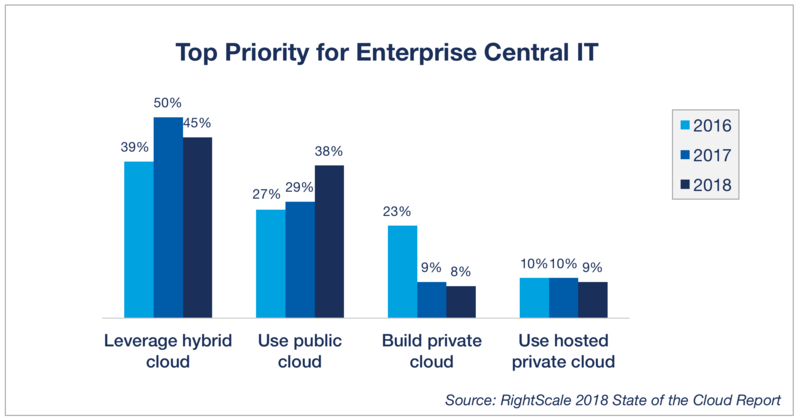 And while the hybrid cloud remains on the lead, it is clear that less companies consider it a priority for their IT infrastructure. Building a private cloud, on the other hand, experienced a significant decrease from 2016 to 2018, dropping from 23% to only 8%. With the notable increase in cloud adoption, it will be no surprise to see the development of cloud services (SaaS, PaaS, IaaS) skyrocketing in the next few years. According to Medium, Software-as-a-Service solutions will see an increase of 18% by 2020, Platform-as-a-Service will become the fastest-growing sector of cloud platforms (56% by 2020), and Infrastructure-as-a-Service will become a $17.5B market by the end of 2018. According to the 2018 BSA Global Cloud Computing Scorecard, which ranks countries’ preparedness for adoption and growth of cloud computing services, Germany receives the highest overall score on the list. Its strong protection for cloud services, among with a comprehensive cybercrime legislation and a great progress in extending broadband access to the population, makes it one of the countries with the best ecosystems for cloud computing adoption.